At Commonwealth Corporation, we are dedicated to workforce development within Massachusetts, a state that is heavily reliant on its aging labor pool. As increasing numbers of the working population retire we are facing an inevitable shortage of skilled talent. 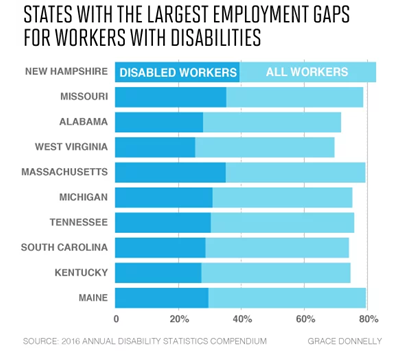 The need for workers is great—and yet Massachusetts sits in the bottom half of states by employment rate for people with disabilities, at approximately 36.6 percent. One solution to the worker shortage in Massachusetts: employ more people with disabilities. While the rate for acquiring a disability increases as one gets older, recent data suggests that most people with disabilities are within the working ages of 18 to 64. This suggests that there are other forces contributing to the employment discrepancy between people with disabilities and people without. There is a great deal of variability in the shares of people with disabilities by state highlighted in the 2017 Disability Statistics Annual Report. Commonwealth Corporation would like to convene experts in the field who are interested in this topic. 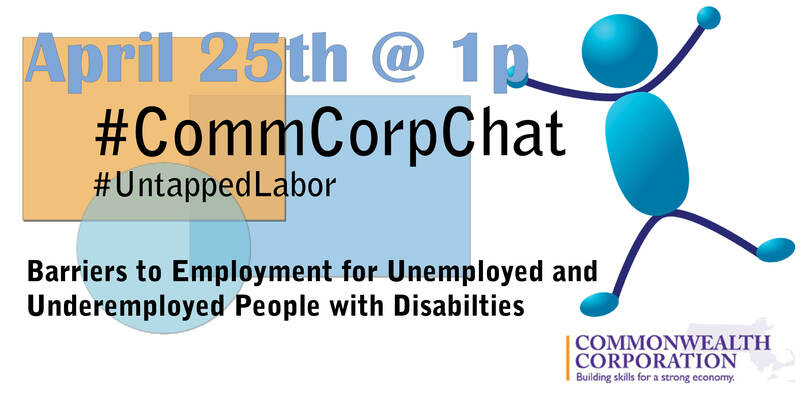 Therefore, using the hashtag #CommCorpChat, we will be hosting a Twitter Chat on April 25th from 1-2pm to discuss the various challenges that make it difficult for people with disabilities to engage fully in the labor market. What are best practices for PWD who chooses to disclose their disability to an employer? How can workers contribute to the de-stigmatization of physical and or mental disabilities? How can a PWD address a gap in their resume when they re-enter the workforce? How can career centers and other workforce development organizations work together with PWD to support their job search? Many hiring procedures draw from normative processes that can exclude PWD from suitable positions. 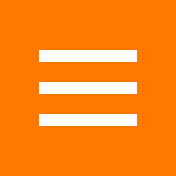 How can employers create a more inclusive hiring process? How can workforce development strategies better support PWD in obtaining the skills, confidence, and support needed to procure a ‘good’ job? How can employers and the disability community collaborate to create a welcoming work environment for PWD? What advice would you give to PWD who want to re-enter the workplace but worry that their benefits will go away as a result? We look forward to engaging in a dialogue that will assist in tackling the systemic issues that have contributed to this employment disparity. We hope you can join us @commcorp_MA!